This note is a follow-up to our comments on FUN, SIX, and SEAS in advance of their Q4 earnings calls this month. Stock shorts, which are essentially a bet that a stock price will fall, are another way of gauging market expectations. Although short selling is a risky proposition like all bets, short sales of a stock generally rise as a company is passing through some rough times, retools its image, or adjusts a core strategy. Short sales give us a pretty good directional barometer of how the streets views those adjustments. The current situation of SEAS is a case in point. The table below shows the short interest as a percentage of total outstanding shares. 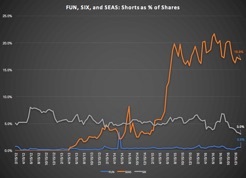 The short percentage for SEAS is significantly higher than that of SIX and FUN at 16.9%. As you can see, short selling of SEAS’ stock initiated shortly after Sea World went public in April 2013. It picked up a bit after the US release of the movie “Blackfish” on July 19th of that year. But short sales for SEAS really took off the day after management admitted in August 2014 that the movie was impairing results. It has hovered in the 16-21% range ever since. It has been relatively high despite management’s strategy adjustments — in the direction of conservation/education and away from shows featuring orcas — and attempts to reign in OPEX and CAPEX. Disclaimer: All short sale data are publicly available and reported every two weeks on their settlement date by FINRA members. Since data on shorts will be reported on the 15th of this month, we will update the chart then. The author does not hold any short stock, but is long in both SIX and FUN.